Located on the southeast portion of Florida, Jupiter is oftentimes considered one of the best retirement cities for individuals looking for a bit of fun in the sun. With a population of around 50,000, Jupiter boasts amazing beaches and a rich history, making this community popular for the 55+ community. Jupiter is a short drive from Palm Beach, so you’re always near city amenities when you’re in the mood for something more than this small town can offer. 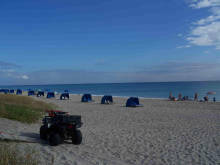 Some of Jupiter's more popular activities include, golfing, boating, kayaking and fishing. Jupiter has several great neighborhoods, with West Jupiter, and Jupiter Village, both worth taking a closer look. Click the tabs on the left to learn more about what it's like to retire in Jupiter! Match me with 3 top Jupiter Realtors!